Frank Lampard wants more ruthlessness and nothing in the way of complacency as Derby County prepare to visit league leaders Middlesbrough on Saturday. The Rams have beaten two of the current top four sides in the last week, a 2-1 win at home to Sheffield United followed by a 4-1 success at West Bromwich Albion on Wednesday night. 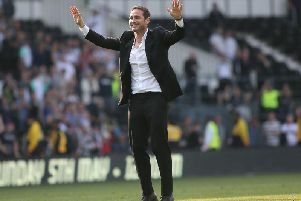 And as Lampard aims for what would be a hat-trick of wins as impressive as any club may achieve in the Championship this season, he feels he knows his side will face another tough challenge. He told RamsTV: "I know they are two good teams and we knew the threats West Brom had going forward. “My mindset wasn’t to go there and attack away from home, it was more how can we approach this game in the right way. It might not be the same, it might be different but I think we have to be flexible in how we approach games. Middlesbrough will also hold an attacking threat going forward. “I can name the players and know the attacking players they have and also defensively they are very strong. You know what to expect with a Tony Pulis team. Middlesbrough are very solid at the back, generally with five at the back, but normally they negate your opportunities to create and score. Rather than reflect too much on the week so far, Lampard was instead concentrating on getting the balance between physical and mental strength right given the relatively short gap between games, with Derby kicking off at lunchtime on Saturday. He said: “I would rather talk about the week after because these two days between West Brom and Middlesbrough now are huge for us. It’s not for the legs, they need to recover. Training is for the players who didn’t start on Wednesday night but it’s more for the mind.